I’ve always loved the story of Baba Yaga, and I never seem to tire of stories told in verse, a storytelling-through-poetry method that works beautifully for whimsical, dark fairytales like this one. Something unique to Finding Baba Yaga, however, is the modern spin Yolen puts on it; while you know that it takes place in modern times, it’s easy to forget when Natasha is in Baba Yaga’s house of magic and mysteries. The reason I love Baba Yaga so much is her affinity for feisty, angry, curious girls. In a world full of fairytales (especially the old ones) where young women are taught to be quiet, take up little space, and do as they’re told, Baba Yaga plays the role of a bizarre, crude, fun, and sometimes terrifying old crone, here to offer reprieve to the girls who never quite learned how to make themselves small. challenging her, turning their backs. laugh at death threats, use foul language, never beg. Yolen’s a pro at storytelling, as her proficient writing career suggests, but what amazed me was how beautiful her poetry is. While it gets a little muddied at points, I found her writing voice so entertaining and bold and lovely, and were she to write more stories in verse in the future, I would eagerly be first in line to read them. 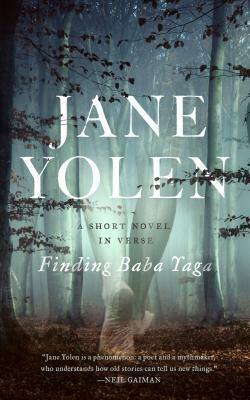 I love the Baba Yaga tale and this one seems really interesting. Thank you for sharing Destiny! Thank you so much! It was definitely worth checking out!